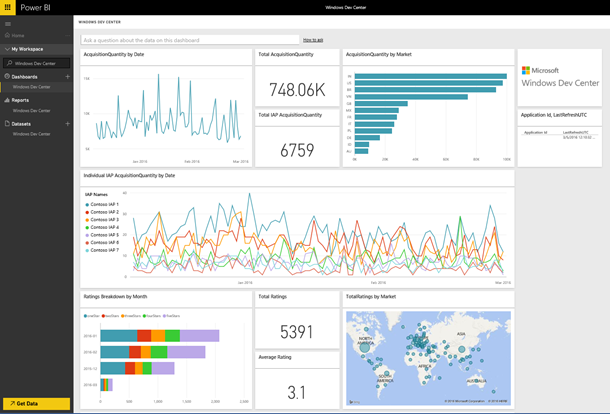 This post will explain how to set up a Power BI dashboard and report for your apps, and how the Power BI content pack can help you analyze your Windows Dev Center data. 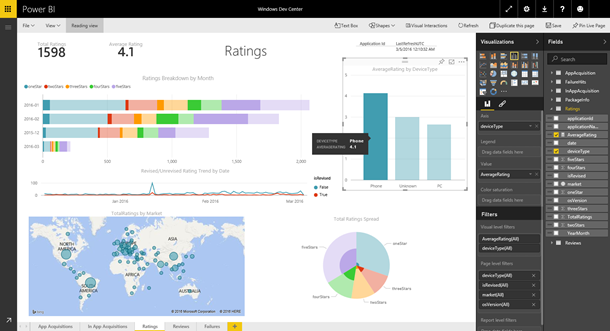 For additional details on how to get started, please see the Windows Dev Center content pack for Power BI help page. To get started using the content pack, simply provide an application ID for an app you own, and then sign in as an Azure Active Directory user for the directory associated with your Dev Center account. You can find the application ID for an app by going to the App identity page under App management. Once the connection is completed, Power BI will automatically create a dashboard, report, and dataset using the analytics data for the app you specified. The out-of-the-box dashboard immediately offers a set of insights, and you can select any of the tiles to drill into 5 pages of reports. Click through the available tabs at the bottom of the report, from Acquisitions to Ratings and Reviews, to drill down into your data. Reports also include metrics for monitoring your application, such as failure events by version and rating breakdown by month. For example, selecting the Acquisition Quantity by Date tile brings you to the App Acquisition report page, where you can see acquisitions by market, age group, device type, and more. Inside the report you can hover over visualizations to see additional details. Selecting a particular segment of the visual will cross filter other visuals on the same page. In each report you can switch to edit mode, where you can edit or add additional visuals to your reports. On the right side of the screen, you’ll see a list of all the Windows Dev Center tables and fields you have access to in the content pack. Select the visual design, filters, and fields to modify reports or create new ones. From any of the reports you can pin the visualizations or tiles to the dashboard by hovering over them and selecting the pin icon. Pinning the visuals will prompt you to select a destination dashboard, allowing you to customize and combine data from multiple sources. After the initial import, the dashboard and the reports will continue to update daily, and you can control the refresh schedule on the dataset. 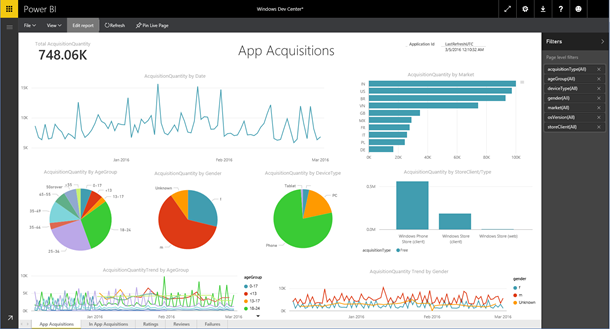 With the Windows Dev Center content pack for Power BI, you have a set of metrics and reports you can use to explore your application data even further.